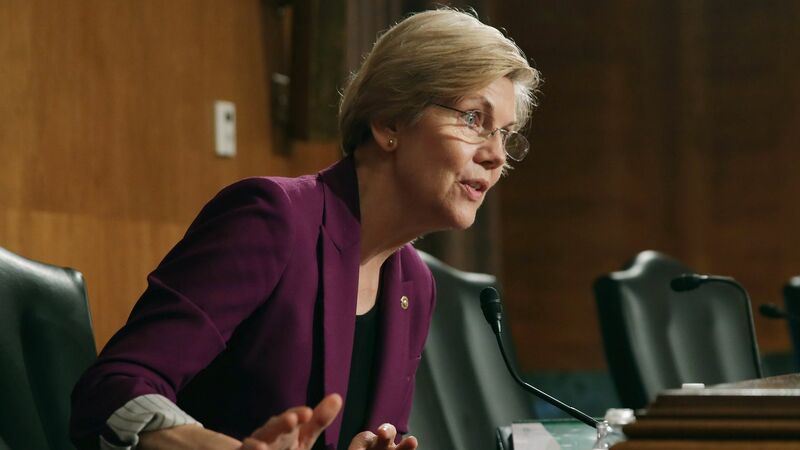 Elizabeth Warren: CEOs should "face jail time for overseeing massive scams"
In a Washington Post op-ed on Wednesday, 2020 presidential candidate Sen. Elizabeth Warren (D-Mass.) proposed a law that "expands criminal liability to any corporate executive who negligently oversees a giant company causing severe harm to U.S. families," citing her previous campaigns against former Wells Fargo CEO John Stumpf and his predecessor Tim Sloan. The big picture: Warren's trustbusting campaign is following a playbook she laid out in 2016. After placing targets on Big Agriculture and Big Tech, the 2020 candidate is going after banking — with health care, telecom and big retail potentially on the list. Details: In her op-ed, Warren said her proposal would specifically apply to negligent CEOs of any company with "more than $1 billion in annual revenue." This falls in line with her proposed wealth tax, which would take an annual 2% tax on assets above a taxpayer's first $50 million, and 3% on assets that exceed $1 billion. After two years at the helm, Wells Fargo CEO Tim Sloan will step down effective immediately. The company's general counsel Allen Parker will serve as interim CEO while the company searches for a new chief executive. Between the lines: Sloan is the second CEO, after John Stumpf, to leave since Wells Fargo's customer abuse scandals came to light in late 2016. Lawmakers have called for Sloan to resign given a string of other controversies that happened under his watch. Officials also questioned how much Sloan knew as COO and CFO when the company's foul sales practices were underway. Also noteworthy: Parker joined Wells Fargo in 2017, which in theory means he will avoid criticism surrounding the bank's controversies that occurred before he was there.